Richard Newsome was born in a modest-sized town in the north island of New Zealand, a little place called Wanganui on a great roiling river, and lived the first few years of his life on an even more modest-sized farm outside of town. His family migrated to Australia when he was two and a half and graciously agreed to take him along.Richard grew up on Queensland's Gold Coast where he enjoyed his time at school and discovered the joy of the written word. He wrote his first book at the age of 12 as part of an English assignment. It was called The Six Dollar Man and detailed Australia's first attempt to construct a bionic human on a shoestring budget. 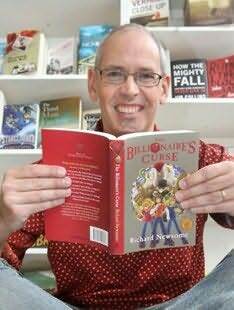 Richard now lives in Brisbane with his wife and three children and is back into a 'fun career' and writing. His book is very reasonably priced and great fortune is said to come to those who buy multiple copies.